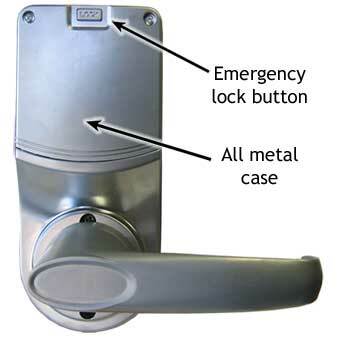 The X45 is our heavy-duty keypad door lock. 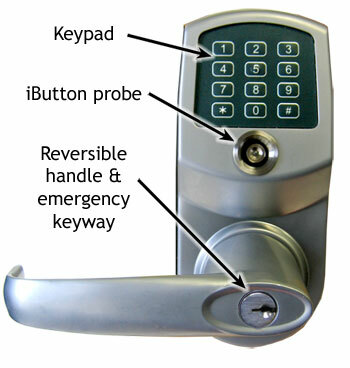 It's weatherproof and can be operated by iButtons or with numeric codes and with or without our AccessPilot PC software (although the software, part of the Lock Management Kit, is highly recommended). The handle is reversible, and the inside half of the lock has a panic button: One touch will instantly lock the door from the inside. Keypad: 12 buttons (0-9 plus * and #). Weatherproof. Access Type: IButton or keycode. Setup and Programming: With AccessPilot software or manually by using the keypad. User Capacity: 800 with software, 300 without software. Audit Trail: 3,000 entries (with AccessPilot software only). Power supply: 4 standard AA batteries with 10,000 operations. Low battery warning. Timed operations: Set particular times of access for users, and schedule automatic operations (for example, locking or unlocking automatically at specified times of day). Modes of operation: Storehouse (after unlocking, it automatically re-locks after a specified number of seconds) and Classroom (after unlocking, it remains unlocked until the lock command is given again). Handle: Left or right; reversible during installation. Emergency key bypass: Standard Schlage C6 or Best SFIC (Special Order). Dimensions: Front: 6½ inches tall x 3 inches wide x 3 inches deep. Back: 6½ inches tall x 3 inches wide x 3 inches deep. Handles: 4½ inches long from centerline of lock cylinder to end of handle. Door thickness: 1⅜ to 2 inches. Door preparation: Standard ANSI A115 Series Prep, modified by adding an additional ¼-inch through-bolt hole to add stability to the lock and increase security. Strike Plate: ANSI Standard 115.3. 1⅛-inch x 2¾-inch T strike with 1¼-inch lip-to-center dimension. Latch: Tubular 2¾-inch backset standard (2⅜-inch backset optional), solid brass with ½-inch throw. 1-inch diameter bore is required. Accessibility Standard: Meets Americans with Disabilities Act (ADA) standards.